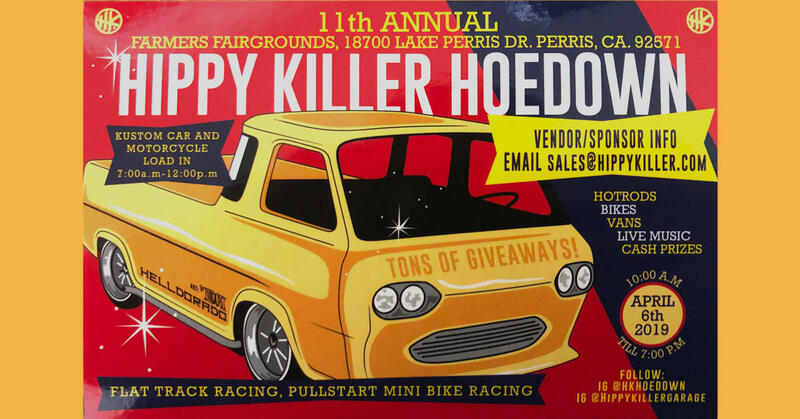 Hippy Killer Hoedown was created for custom vehicles, friends, families and fans. Expect live music, giveaways, custom cars, vans, motorcycles, trucks, flat track and pull start mini bike racing. Located at the Farmers Fairgrounds in Parris, CA the main gates open at 10 am to 7 pm. Location: Farmers Fairgrounds, 18700 Lake Perris Drive, Perris, CA. Gates open to the public from 10 am to 7 pm. Thousands of dollars in giveaways, flat track mini bike racing, live music from multiple bands, custom cars, vans, motorcycles and vintage and hooligan motorcycle flat track racing. TSOL, Deadbolt, Santos Y Sinners, James Intveld, Duane Mark & Co, Rockin Coyotes and more!